How to reach new markets with eCommerce logistics in India? Are you looking for ways to expand your ecommerce business? If yes, then here are a few pointers to help you gain new markets through effective logistics servicing. Ecommerce in India is growing at a rapid rate and companies are struggling to stay ahead in the competition. With new e-ventures starting every other day, marketers are looking at every possible way to reach out to new markets while retaining existing customers. However, ensuring the timely delivery of goods in perfect condition remains one of the prime factors behind customer satisfaction. That is why it is important to rely on a reputed company to handle your ecommerce logistics in India. With internet reaching every nook and corner of the country, online shopping has also become common among Indian households. It is no longer attributed only to major metro cities. Moreover, multi-device accessibility of online shopping sites has made it possible to make an online purchase from anywhere in the country in just a few clicks. To reach out to new customers, ecommerce companies have to depend on logistics services that can help you branch out to new cities. Logistics, which is a critical link between ecommerce companies and their customers, has become one of the key differentiators among ecommerce companies. Currently, there are multiple third-party companies that provide ecommerce logistics in India. You need to look for one that has access to a large market base and can help your business grow. With immense experience in handling digitised logistics services for ecommerce companies, ShipKaro logistics service provider can help you streamline your supply chain management efficiently. Moreover, we have delivery services to over 20,000 PIN codes in India, thus enabling you to venture into new markets. Shipping with multiple partners: For a single order, you have multiple options to choose your shipping partner. You can compare prices of the different options and choose the most convenient or economical one. This not only reduces operational costs and saves time, it also gives you access to a large number of locations. You no longer have to display the embarrassing message “This product is not available in your location” and lose a valuable customer. Availability of multiple partners ensures delivery to even Tier III cities, which consequently means new customers. COD support: Indian ecommerce sector thrives on cash on delivery options. There are several customers in India who still depend on COD as a payment option for online shopping. That is why it is imperative for successful ecommerce logistics in India to have this option. ShipKaro offers the provision to handle COD as a payment option through automation. It not only helps you retain your existing customers but also creates new ones. Wide coverage: ShipKaro has delivery services to over 20,000 PIN codes in India. Therefore, now it is much easier than before to ship to even the remote corners of the country and reach out to every potential customer. With orders coming in from every part of the country, you should not lose out on customers with fewer delivery services. ShipKaro ecommerce logistics in India lets you target all these customers and provide hassle-free deliveries. Customer retention: A satisfied customer can create several other potential customers. With timely deliveries and efficient servicing, you can ensure that your customer becomes a channel for further leads. A reliable logistics service provider can ensure that your customer receives the correct order within the stipulated time. Our automated logistics management generates shipping labels without manual intervention, eliminating chances of manual errors. Moreover, with cutthroat competition, it has now become important for marketers to ensure speedy deliveries of their orders. Speedy Deliveries: With multiple options to choose from, you can look for options that are the fastest. During peak sales seasons, with a large number of orders to be fulfilled, some deliveries take longer than usual. This problem can be avoided with the availability of multiple shippers. ShipKaro ecommerce logistics in India lets you choose from different shippers in terms of their prices and their delivery time. This way you can ensure that your customer receives the order in less time. While there are companies depending on in-house logistics services and traditional logistics services, they are not able to compete with the growing demands of the customers. Unless you have the potential to focus on logistics, this complicated yet essential part can drain a large chunk of your company’s resources. Moreover, it is extremely time to consume to reach out to every customer in every corner of the country. That is why more and more ecommerce companies are now opting for digitalised logistics services that ensure complete transparency and efficient services. Ecommerce logistics in India has changed drastically with the advent of such technology enabled logistics service providers. It is now easy to reach to every corner of the country and fulfil every customer order. No need to waste time on manually searching for logistics partners and negotiating prices. Technological interventions ensure automation of all these processes giving you the option to choose the most affordable and convenient option from a list of choices. At every step of your order fulfilment, technology enables your smooth flow of operations, thus saving your time and resources. The tech-savvy generation now considers online shopping as one of the most convenient modes to buy different kinds of products. With multiple websites for almost everything under the sky, customers are relying on online shopping for all their small and big purchases. Ecommerce logistics in India is on a growth rate with new and new buyers emerging every single day for online shopping. It is important to stay ahead in the competition with a reliable logistics partner by your side. Big or small, your logistics service provider should be scalable enough to accommodate your business requirements; and help you grow in the process. 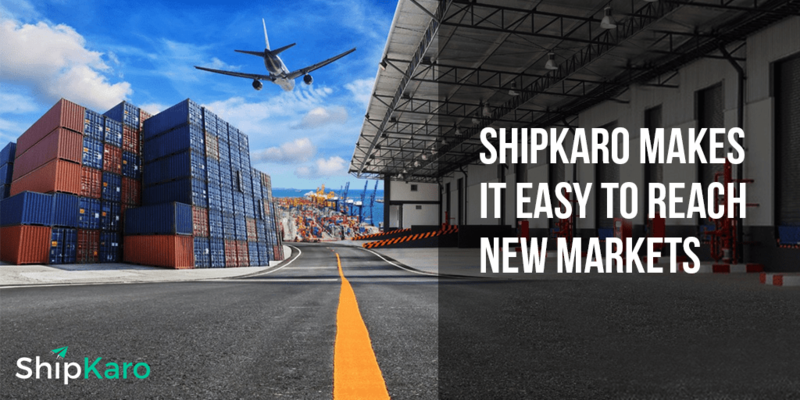 With ShipKaro, you can not only simplify your existing logistics but also develop your business. by venturing out into new markets.